Want to learn more about the Rules of Golf? Click here to register for one of our 2019 seminars! These 3-hour seminars are free to attend and will provide an overview of the major changes and Rules situations often encountered during the play of a round. 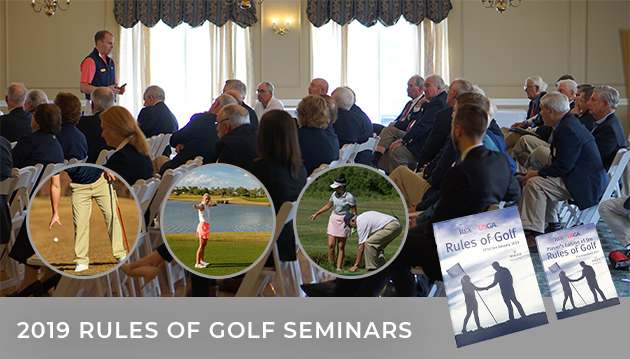 These seminars are taught by USGA expert certified Rules instructors who will be happy to answer your Rules questions! Attendees will enjoy a complimentary continental breakfast and copy of the Players' Edition of the Rules of Golf. The NYSGA is now offering three full-day Rules Seminars, prepared for recreational golfers to NYSGA Rules Officials. The seminar will include a presentation covering nearly every Rule, with focus on the most common Rules situations encountered by golfers. The USGA's 80-Question Certification Exam will be offered at the host club the next morning at 9:00am. The fee to attend is $35, which includes lunch and a copy of the Rules of Golf and the Official's Guide to the Rules of Golf.